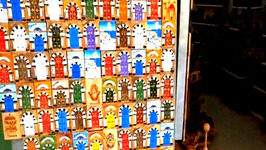 My tips for travellers video tour of the old town in Tunis. The Medina has a market in narrow streets that are easy to get lost in. This Hominy Grits and Turnip Greens are a mealtime favorite with me ! Nutritious vegetable and corn are a welcome meal at anytime of the day, especially when I'm a bit tired. Sampe this wonderfully flavored and incredibly tasty Jellied Coconut Ring . So just whip up this goregeous Jellied Coconut Ring anytime you feel like, as this required no ..